have been rendered speechless by the subtle analysis of the human nature. 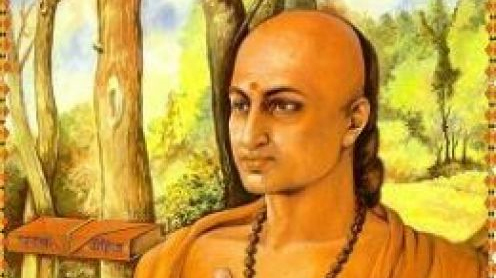 "Chanakya Sutra" has 531 shlokas. A translation of the first 90 shlokas is given below. of the State by giving them the correct dispositions. The basis of all "dharma" is "artha" or wealth. The basis of all "artha" is "rajya" or the State. The basis for the stability of the State lies in control over the "indriya"
or sense faculties providing pleasure. The basis for control over the sensual faculties is in "vinay" or humility. The basis for humility is devotion to those grown old through wisdom. duties with the maximum efficiency. principles, the State can function effectively even without a king. for State functioning lies in the acceptance and good wishes of the people. possible for the ruler to take the right decisions regarding his duties. without a council of ministers. temperament both in times of prosperity and adversity, is best. a problem, and solves it with the maximum efficiency and use of imagination. knowledge of laws, he also passes tests conducted secretly. beneficial and non-beneficial consequences of the task is kept secret. the task under his supervision. to pass into the hands of the enemy. create discord among ministers must be blocked. Complete security for the ministers is necessary for the good of the State. the continued existence and good health of the ministers. weaknesses. Only capable ministers can provide him with such information. drowning the views of others. A reasonable attitude must prevail. righteous conduct, have overcome selfish desires and have conscience. are best suited to be friends. By acquiring true friends, one gains strength. The strong try to get advantages to which they have no right. Giving even a little to the lazy does not protect material wealth. Without continued increase of wealth, the demise of the State is inevitable. learning and experience, there can be no progress for the State. waste of the wealth of the State. the State are based upon moral principles. there is prosperity and happiness for the State. It is worthy for the king to follow the path of high principle. The enemy can attack the State at any time. Two warring States become friendly later. One does not acquire either friends or enemies without reason. alliances with a stronger and powerful State. powers, just as there can be no strong union between hot iron and cold iron. The king must never fight another king of equal strength. from those mounted upon elephants. discord and division among his people. A weak king should seek the protection of a powerful and principled monarch. lack of self-confidence and incompetence. get burnt if parities are not maintained. Rebellion against the State should not be done. legitimate ruler of the State. more manageable when confined to small and mutually warring groups. Those prey to gambling are unfit to execute the functions of the State. Addiction to hunting is destructive to morality and wealth. acquire the goods that sustain life. Note: This is an extra sutra in certain texts. Those prey to drinking are unfit to be trusted with important work. hearers, sowing the seeds of conflict. State, and should have the support of the people of the State. treasury, and so leads to the impoverishment of the State. enemies to become more powerful. being correctly, impartially and efficiently administered. The capacity to inflict punishment is the ultimate resource of the State. corrupt the functioning of the State. deter potential wrongdoers from causing harm. systems of punishments are administered. Upon the personal safety of the ruler depends the safety of the people. individual may make about his behaviour. accordingly. He represents the full power and majesty of the State. of the people is aligned with that of their ruler.